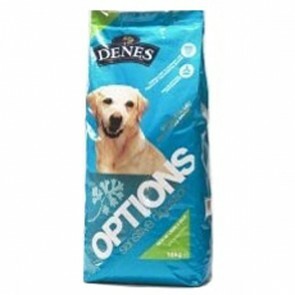 Denes Dog Food is hypoallergenic and free from all artificial colours, flavourings, preservatives and does NOT contain any soya protein or added salt to enhance and stimulate appetite. Available in two adult option varieties; Sensitive Digestion Lamb & Rice and Healthy Skin Chicken with Turkey & Rice that both include beneficial herbs. 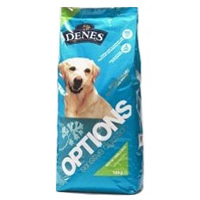 Denes Options Dog Food is preserved using natural antioxidants and only contains High Quality, Natural Ingredients with the added benefit of herbs to provide the most convenient and practical way of feeding your dog a natural diet that resembles the way a dog would feed in the wild, to help maintain your dog's long term health and vitality. Herbs are added to both the Healthy Skin and Sensitive Digestion Options Dog Food varieties not only to supply natural flavours and improve aroma of the food, but also to promote good health and well being. Denes: 5 stars out of 5 based on 0 user reviews.